Solar storms have the power to plunge Earth into the dark ages in the blink of an eye by destroying satellites and wiping out electronic communications. Predicting them has been described as one of most important astrophysics goals of modern time. In 2015 I began modelling a new approach to the force of gravity in order to try and calculate, not what gravity does as we see it, but how it actually works. The complex model is called 4D Em Superfluid Quantum Gravity and it treats “Space Time” not like the traditional fabric presented by Einstein, but like a special kind of liquid that can travel through almost anything. If you are interested in learning more about that you can take a look at my publications pages. The first clues to how the sun might be affected by the rest of the solar system first came from highly experimental quantum big data analytics. As I run countless years of information through a quantum simulation and analysed the patterns produced, it became apparent that the sun is connected to a lot of things, from planetary orbits to the price of food. "Traditional tidal calculations were thrown out in favour of a new 'superfluid quantum gravity'"
I began to apply the approach to modelling the solar system and created a live simulation of it that could calculate the effect that each planet had on its neighbour and of course the sun. Traditional tidal calculations were thrown out in favour of a new “superfluid quantum gravity” model, and as soon as the data began to come out, it seemed clear something exciting was emerging. One of the primary aims of the research was to understand the possible ways that gravity might interact amongst planetary bodies like Mars and Saturn and despite previous attempts to unravel the mystery, a model that could correlate the observed effects to a calculable algorithm remained elusive. We are all familiar with the tides of the sea, but did you know that the sun also has tides? They are not quite the same relaxing experience we have here on earth but the general idea is the same. Planets move the super high temperature plasma on the surface of the sun and cause small changes in its magnetic stability. These phenomenon are generally seen as “sun spots” and also we experience them as huge blasts of solar wind caused by “Coronal Mass Ejections”. These winds cause the Northern Lights that attract people every year to Norway to witness natures most enchanting light show. Problem is , beyond saying it will be a high or low year, predicting them is really hard! The image above shows the results obtained using the newly developed quantum big data predictive analytics for the single month of February in 2015. (you can see the entire data set by visiting the link here or my publications page). "the model was able to predict the approximate behaviour of the sun 16 years before the fact!" 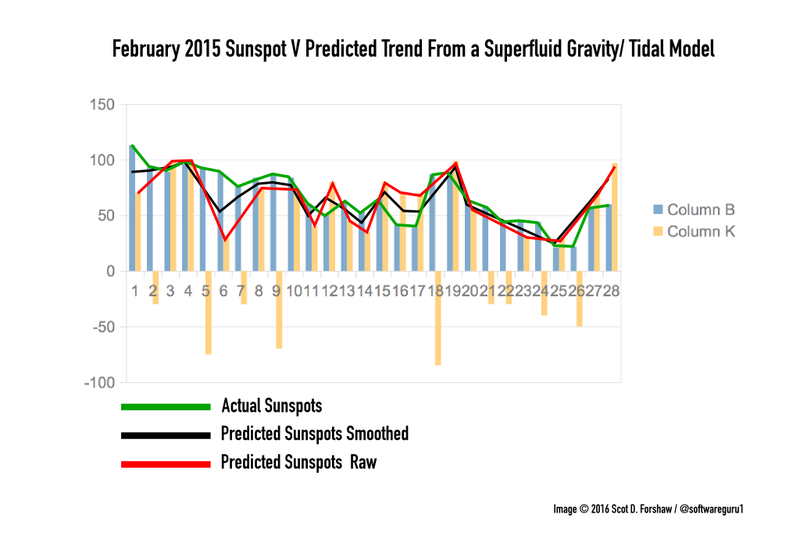 What the graph shows is that quantum gravity model was able to predict the approximate trend of sunspot activity with a high degree of accuracy. What is more astounding is that this prediction was effectively 16 years in advance! How? Because this software is programmed to model the solar system from the year 2000, and in addition has ZERO DATA ON SOLAR ACTIVITY built in. That means that purely from the position of the solar system and the calculations of solar stress produced by quantum gravity, the model was able to predict the approximate behaviour of the sun 16 years before the fact! … interesting? I think so. What about these Earth Killing Storms then? OK, being able to approximately predict the sunspots is already some serious progress, but what about these solar super storms? Well, take a look at Wikipedia's article on the 1859 Carrington Event (link here) , which tells of how the USA was all but electrically wiped out when a solar geomagnetic storm wreaked havoc with the telegraph and radio service. An event like this today (and there has been a few in the last 20 years or so) could literally wipe out trillions of dollars of electronics equipment, satellites and other sensitive systems. Not to mention the risk to Nuclear Power Stations!!! So, predicting them as you can imagine is really something we need to learn to do. The algorithm of the software were programmed to detect only the most serious quantum gravity distortions that might affect the sun. When the model was run from 2000 to 2016, the results confirmed that it was capable of detecting CME for many large past storms. The above image is a quick screen shot that shows the softwares interface scan locked and stopped on 8th September 2015. The spreadsheet behind, shows that this date, and then later the 13thSeptember were both days of significant major solar storms. In fact when the entire 16 year period was modelled with the current parameters, 14% of all CME events were indicated exactly on the period they happened and in the best performing years over 20% of all CME storms that year were exactly predicted. What is more significant is that periods were there were groups of storms on consecutive days or very close were also identified (often isolated by months of non events either side). If the results were random then this kind of correlation would never occur. The conclusion so far is that this model, which is able to predict as may as 20% of CME events upto 15 years in advance can be refined to improve the result to at least 60% as the data is analysed and new rules learned by the system. If we can predict these storms, we have the chance to overt some of the most serious natural disasters that could ever occur, save governments trillions of dollars (as estimated by global insurance firms) and make the world a little safer. Since this article was written the prediction accuracy has been improved to approximately 65% for CME/Solar Storm events predicted within the period of the event.